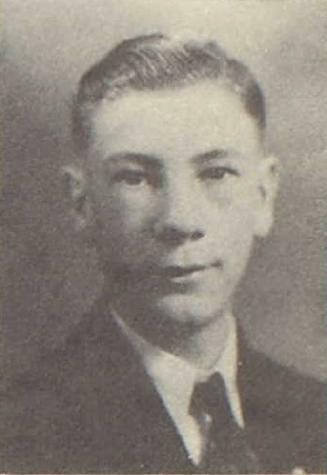 James Pyle was born in March 1898 at Illinois. He was the son of Sylvester Pyle and Emma E. Wilson. [S245] U.S. Federal Census 1900 U.S. Federal Census, by Ancestry.com, ED102. Dwelling 198. [S243] U.S. Federal Census 1920 U.S. Federal Census, by Ancestry.com, ED219. Dwelling 54. George E. Pyle was born in April 1891 at Illinois. Meda J. Pyle was born in July 1888 at Illinois. She was the daughter of Sylvester Pyle and Emma E. Wilson. Married Name Her married name was Twombley. Dorothy E. (?) married Lewis W. Twombley, son of William Lucas Twombley and Maude May Stolzer. Dorothy E. (?) was born in September 1916. 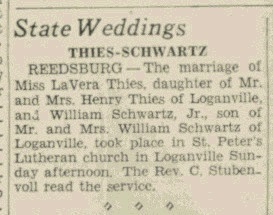 William G. Schwartz married Lavera Anna Thies, daughter of Henry F. Thies Sr. and Bertha E. Ritzer, on 6 June 1937 at Loganville, Sauk, Wisconsin, LaVera Thies and William Schwartz Jr wedding announcement. William G. Schwartz died on 14 November 1975. Name Variation Henry F. Thies Sr. was also known as Heinrich. Henry F. Thies Sr. was born on 1 July 1878 at Wisconsin. He was the son of Charles H. Thies and Elizabeth Meyer. Henry F. Thies Sr. died in August 1971 at age 93. Henry F. Thies Sr. obtained US Social Security Card at Wisconsin; last residence Reedsburg, Sauk, Wisconsin. [S245] U.S. Federal Census 1900 U.S. Federal Census, by Ancestry.com, ED149. Dwelling 154. [S250] U.S. Federal Census 1930 U.S. Federal Census, by Ancestry.com, ED31. Dwelling 96. Married Name 17 December 1902 As of 17 December 1902,her married name was Thies. Bertha E. Ritzer was born in September 1883 at Wisconsin. She was the daughter of William A. Ritzer and Ernestina (?). Bertha E. Ritzer died in 1967. Children of Bertha E. Ritzer and Henry F. Thies Sr.
[S245] U.S. Federal Census 1900 U.S. Federal Census, by Ancestry.com, ED137. Dwelling 12. Name Variation Esther D. Thies was also known as Ester. Married Name 17 February 1935 As of 17 February 1935,her married name was Ott. Esther D. Thies was born on 13 April 1910 at Wisconsin. She was the daughter of Henry F. Thies Sr. and Bertha E. Ritzer. Esther D. Thies married Harold A. Ott on 17 February 1935. Esther D. Thies died on 25 August 2003 at age 93 Esther D. Ott, age 93, of Reedsburg, died on Monday evening, Aug. 25, 2003, in the Sauk County Health Care Center. She was born on April 13, 1910, in the township of Reedsburg, the daughter of Henry and Bertha (Ritzer) Thies Sr. On Feb. 17, 1935, she was married to Harold A. Ott. Esther was a lifelong member of St. Peter's Lutheran Church. She enjoyed playing cards, cooking and spending time with her grandchildren and great-grandchildren. She will especially remembered for her rose garden and her Christmas cookies. Survivors include three children, Duane (Geraldine) Ott of Singapore, Marjorie Schmidt of Reedsburg, and Carla (Clifford) Ott-Oldre, of Maple Grove, Minn; six grandchildren; 15 great-grandchildren; two sisters, Ruth (Clarence) Dreifke of Reedsburg, and LaVera (Milton) Wollschlager of Reedsburg; two sisters-in-law, Evelyn Thies of Reedsburg, and Milda Thies of Marshfield; many nieces and nephews; other relatives and friends. She was preceded in death by her husband, Harold, on Feb. 25, 1984; her parents; a grandson, Curtis Schmidt; her son-in-law, Robert Schmidt; seven brothers, Henry Jr., Erwin, Herbert, Clarence, Carl, Raymond and Norman; and a sister, Marcella Giese. Funeral services will be conducted at 11 a.m. on Friday, Aug. 29, 2003, at ST. PETER'S LUTHERAN CHURCH, Loganville. Interment will be in the church cemetery. The family will receive friends from 4 p.m. until 8 p.m. on Thursday, Aug. 28, 2003, at the HOOF FUNERAL HOME, Reedsburg. In lieu of flowers, memorials to St. Peter's Restoration Fund or the Sauk County Health Care Center would be appreciated. Harold A. Ott married Esther D. Thies, daughter of Henry F. Thies Sr. and Bertha E. Ritzer, on 17 February 1935. Harold A. Ott died on 25 February 1984. Robert Schmidt died before August 2003. Married Name 2 October 1948 As of 2 October 1948,her married name was Dreifke. Ruth E. Thies was born on 24 December 1921 at Wisconsin. 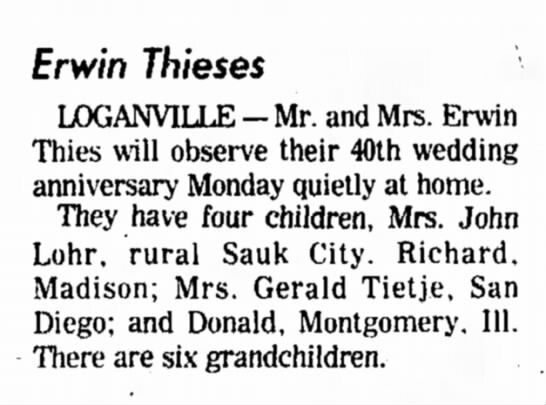 Ruth E. Thies married Clarence O. Dreifke, son of Herman C. Dreifke and Elfreida J. Eickert, on 2 October 1948. Ruth E. Thies died on 25 December 2007 at age 86. Ruth E. Thies obtained US Social Security Card at Wisconsin; last residence Reedsburg, Sauk, Wisconsin. Clarence O. Dreifke was born on 30 May 1918. He was the son of Herman C. Dreifke and Elfreida J. Eickert. Clarence O. Dreifke married Ruth E. Thies, daughter of Henry F. Thies Sr. and Bertha E. Ritzer, on 2 October 1948. Clarence O. Dreifke died on 9 December 2012 at age 94 Clarence O. Dreifke, age 94, of Reedsburg, died on Sunday, December 9, 2012 in the Reedsburg Area Senior Life Center. He was born on May 30, 1918 at North Freedom, the son of Herman and Elfreda (Eickert) Dreifke. Clarence was a veteran of World War II serving with the U.S. Army-Air Force. On October 2, 1948, he was united in marriage to the former Ruth E. Thies. Clarence worked as a city mail carrier for the Reedsburg Post Office for thirty years until his retirement. He was a lifelong member of St. John's Lutheran Church in Rock Springs. He was also a member of the Reedsburg American Legion. He enjoyed hunting, fishing and playing cards. Survivors include his sister: Ruby Behn, of Reedsburg; two sisters-in-law: LaVera Wollschlager, of Reedsburg and Evelyn Thies, of Reedsburg; many nieces and nephews; other relatives and friends. He was preceded in death by his wife, Ruth, on December 25, 2007; his parents; his brother: Erwin Dreifke and his sister: Lillian Wolters. Funeral services will be conducted at 11:00 A.M. on Friday, December 14, 2012 at St. John's Lutheran Church in Rock Springs with Pastor David Karow officiating. Interment will be in St. John's Cemetery with military rites conducted by the Reedsburg American Legion. The family will receive friends from 4:00 P.M. to 7:00 P.M. on Thursday at the Hoof Funeral Home in Reedsburg. In lieu of flowers, memorials to St. John's Lutheran Church would be appreciated. The Hoof Funeral Home is serving the family. 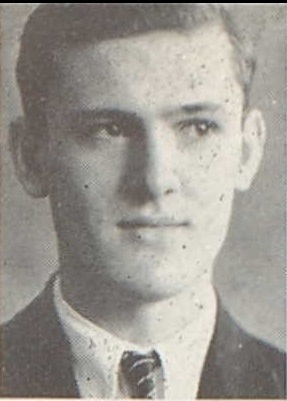 Clarence O. Dreifke graduated in 1936 at Reedsburg High School, Reedsburg, Sauk, Wisconsin. Curtis Schmidt was the son of Robert Schmidt. Curtis Schmidt died before August 2003. Henry W. H. Thies Jr.
Henry W. H. Thies Jr. married Ruth Foege. Henry W. H. Thies Jr. was born on 16 October 1905 at Wisconsin. He was the son of Henry F. Thies Sr. and Bertha E. Ritzer. Henry W. H. Thies Jr. died on 3 December 1961 at age 56. Name Variation Erwin A. Thies was also known as Ervin. Erwin A. Thies was born on 18 February 1904 at Wisconsin. Erwin A. Thies married Hertha Meta Emilie Hasz, daughter of Theodore N. Hasz and Wilhemina B. (? ), on 20 September 1936. Erwin A. Thies died on 13 August 1986 at age 82. Erwin A. Thies obtained US Social Security Card at Wisconsin; last residence Loganville, Sauk, Wisconsin. On 20 September 1976 Mr and Mrs Erwin Thies 40th wedding anniversary. Herbert E. Thies married Evelyn M. (?). Herbert E. Thies married Hertha M. (?). Herbert E. Thies married Viola Bertha Gluth, daughter of Paul Gluth and Meta Schroeder. Herbert E. Thies was born in 1908. Herbert E. Thies died in 1996. Clarence William Thies was born on 30 October 1913 at Wisconsin also reported as Dec 1913. 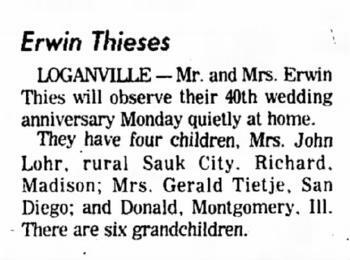 Clarence William Thies married Milda Dorothy Heiden, daughter of Albert F. Heiden and Alma I. Hinrichs, on 5 August 1939. Clarence William Thies died on 11 March 1995 at Wood, Wisconsin, at age 81. Clarence William Thies obtained US Social Security Card at Wisconsin; last residence Marshfield, Wood, Wisconsin. Carl Martin Thies was born on 6 May 1911 at Wisconsin. Carl Martin Thies married Edna Emma Martha Lutterman, daughter of Henry William Lutterman and Emma Voss, on 16 November 1941. Carl Martin Thies died on 20 July 1994 at age 83. Carl Martin Thies obtained US Social Security Card at Wisconsin; last residence Reedsburg, Sauk, Wisconsin. Raymond H. Thies was born on 8 June 1916 at Wisconsin. Raymond H. Thies married Evelyn M. Schmidt, daughter of Walter Schmidt and Clara F. Quandt, on 8 June 1946. Raymond H. Thies died on 14 October 1996 at age 80. Raymond H. Thies obtained US Social Security Card at Wisconsin; last residence Reedsburg, Sauk, Wisconsin. Norman W. Thies was born on 6 April 1920 at Wisconsin. Norman W. Thies died on 12 December 1995 at age 75. Norman W. Thies obtained US Social Security Card at Wisconsin; last residence Whitewater, Walworth, Wisconsin. He graduated in 1938 at Reedsburg High School, Reedsburg, Sauk, Wisconsin. Married Name Her married name was Giese. Marcella I. Thies was born on 23 December 1925 at Wisconsin. Marcella I. Thies died on 13 January 1992 at Rock, Wisconsin, at age 66. Joseph Kuchta Sr. was born in June 1847 at Bohemia. He married Mary (?) circa 1877. Joseph Kuchta Sr. died after June 1900. [S245] U.S. Federal Census 1900 U.S. Federal Census, by Ancestry.com, ED35. Dwelling 15. Married Name circa 1877 As of circa 1877,her married name was Kuchta. Mary (?) was born in May 1861 at Bohemia. She married Joseph Kuchta Sr. circa 1877. Mary (?) died after 1900. Mary (?) had 8 with 7 living in 1900 children. Children of Mary (?) and Joseph Kuchta Sr.
Anton Kuchta was born in June 1882 at Nebraska. He was the son of Joseph Kuchta Sr. and Mary (?). John Kuchta was born in February 1884 at Nebraska. Annie Kuchta was born in February 1886 at Nebraska. She was the daughter of Joseph Kuchta Sr. and Mary (?). Julia Kuchta was born in May 1888 at Nebraska. Name Variation Agnes Kuchta was also known as Agness. Agnes Kuchta was born in June 1890 at Nebraska. Rosy M. Kuchta was born in January 1894 at Nebraska. Name Variation Marcella M. Griffin was also known as Sally. Married Name 18 July 1943 As of 18 July 1943,her married name was Sumwalt. Marcella M. Griffin was born on 28 September 1924 at Wisconsin. She was the daughter of Arthur E. Griffin and Jennie M. (?). Marcella M. Griffin married Lawrence E. Sumwalt, son of James Archie Sumwalt and Nellie Jane Kittle, on 18 July 1943. Marcella M. Griffin died on 5 June 2004 at age 79 Marcella M. "Sally" Sumwalt, age 79, died at Don and Marilyn Anderson HospiceCare Center on Saturday, June 5, 2004, from complications of a stroke. She was born in the town of Willow on Sept. 28, 1924, to Arthur and Jennie Griffin. She graduated from Lime Ridge High School in 1942. She was united in marriage on July 18, 1943, to Lawrence E. Sumwalt who preceded her in death. In 1954, they moved to Madison where she resided until 1998 when she sustained a stroke. Sally worked as a retail sales clerk at Sears for several years. She spent several years providing child care to her grandchildren as well as many other children who always called her "Grandma." Since 1998, she resided at Waunakee Manor. She was a member of Monona Oaks (Faith Baptist) Church since its beginning in 1955. She volunteered her time and talent as long as she was able to do so. She loved the church and enjoyed serving the Lord. Sally is survived by her three sons, Melvin (Kim) of Middleton, Myron "Dean" (Barbara) of Richland Center, and Gordon (Laurie) of Portage; six grandchildren, Gary (Allison) of Poynette, Connie (Robert) Thomas of Sun Prairie, Julie of Madison, David (Melissa) of Atlanta, Ga., Jason (Lynette Linke) of Chicago, Ill., and Jacob (Anisa Benton) of Myrtle Beach, S.C; four great-grandchildren, Gavin, Cassandra, Parker and Isabella; a sister, Lucille (Eldon) Moore of Richland Center; a brother-in-law, Laddie Lawrence of Indianapolis, Ind; sisters-in-law, Hazel of Indiana, Bernice Sumwalt of Richland Center, and Ruth (George) Cummings of Raleigh, N.C; many nieces; nephews; and friends. She was preceded in death by her beloved husband, Lawrence, in 1991; her parents; her brothers, Arnold and William "Bill;" and a sister, Ruth. Funeral services will be held at MONONA OAKS CHURCH, 6200 Monona Drive, Monona, at 11 a.m. on Saturday, June 12, 2004, with the Rev. William Bartz officiating. Burial will be in Roselawn Memorial Park. Friends may call at the church from 9 a.m. until the time of the services on Saturday. In lieu of flowers, the family suggests that memorials be made in her name to Don and Marilyn Anderson HospiceCare Center, or to Monona Oaks Church. The family would like to thank the staff at the Don and Marilyn Anderson HospiceCare Center and Waunakee Manor Nursing Home for the support and excellent care during her stay. Marcella will be remembered for her service to the Lord and her love for children. She touched many lives within her family and children she loved and cared for. Gunderson East Funeral Home (608) 221-5420. In October 1973 at Wisconsin celebrated Nellie (Kittle) Sumwalt's 81st birthday and 24th wedding anniversary of Mr and Mrs Leonard Sumwalt. [S250] U.S. Federal Census 1930 U.S. Federal Census, by Ancestry.com, ED17. Dwelling 59.